“And on the twelfth day…” I’m thankful for poetry. That’s right, I’m not talking about literature in general. I’m talking about my roots in writing… poetry. I started where most people start: (puppy) love, and I simply expanded from there, going into more of the grotesque and “self” poetry. However, I’m not thankful for my own poetry. I’m grateful for the poetry that got me started. The likes of Poe and Longfellow, of Whitman and Tennyson, of Neruda and Holmes… and notice how I didn’t say Shakespeare! I was one of those kids who was such a nerd that I would memorize a poem every year and perfect the delivery of the poem that I would do “performances” for my parents and other relatives, complete with hand gestures and dramatic voice. 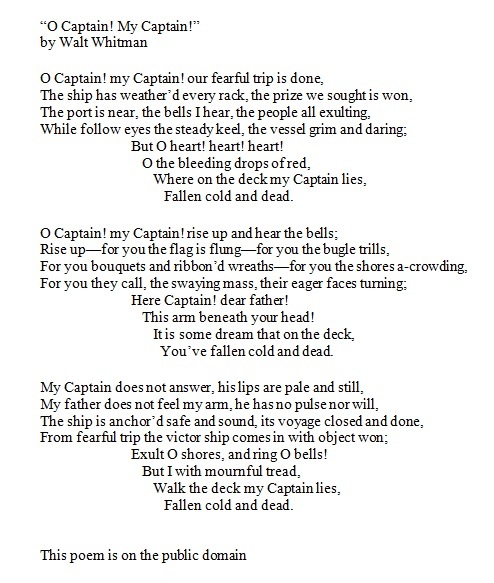 My first poem was actually Walt Whitman’s “O Captain! My Captain!” in fifth grade after I had watched the movie Dead Poets Society (starring Robin Williams as the teacher). Maybe it was Robin Williams who drew me into the poem or perhaps the underlying pain and angst within the poem itself, but when I put my head to memorizing the poem, I remember crying my eyes out the first time I recited aloud. Maybe because my godmother had just passed, and she was “my Captain”, my role model for so long. It’s been so long ago that I really can’t remember the reason behind it being my first poem. 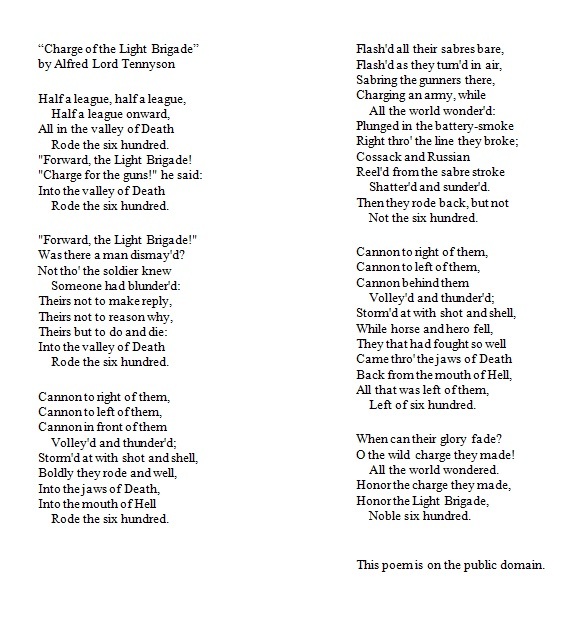 Alfred Lord Tennyson’s “Charge of the Light Brigade” was my next poem, and I was in sixth grade. (Well before Blind Side made it popular.) I had read it in the collection of famous poetry book that I was using for Whitman’s poem, and I know I fell in love with the history and the honor of the soldiers. I was a big history – American Civil War – nerd back in grade school, and anything around that era, especially the “mini wars” and big battles, I was sucked into it. “The Raven” by – duh – Edgar Allan Poe was my #3, along with his “Annabel Lee”. 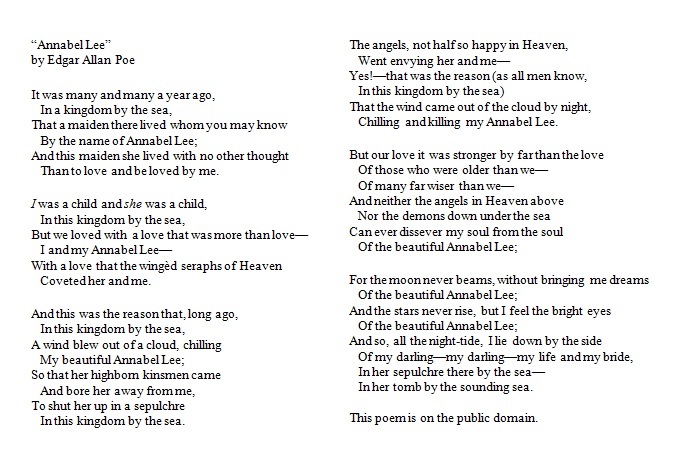 I was in seventh grade, and I was welcomed by Poe’s literature into the dark, self-loathing world of the grotesque, but yet “The Raven” and “Annabel Lee” were two beautiful pieces of poetry that had a sense of human hope… that in the end got stomped back down to nothing. *shakes head* Geez. Such angst and depression-inducing stuff, but the poems were just so lyrical and rhythmic that you can’t help but get really into the words. I remember sitting in the dark with a flashlight as my spotlight in my dark bedroom, whispering both poems to no one in particular. I have yet to complete Henry Wadsworth Longfellow, and I started his epic poem back in fifth grade. It’s just so hard to remember all the parts of “The Song of Hiawatha”. Though I have a little time nowadays that I can probably squeeze some time to work on memorizing the long piece… *squints*… You know, I’m going to let that thought fall because I’m actually considering it now. 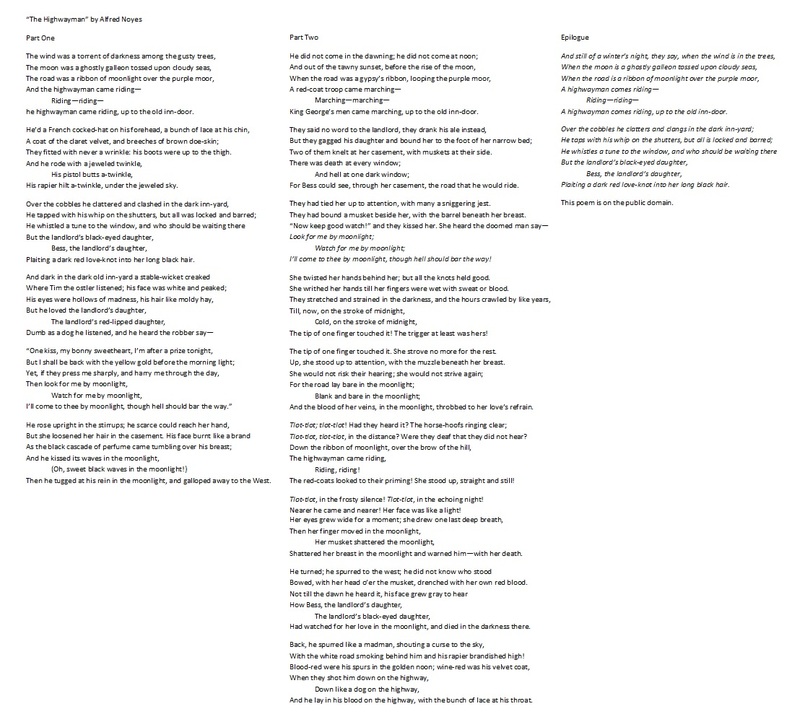 If you’re not familiar with the poem, it’s a total of 23 parts (Introduction poem plus 22 poems). Each poem is about 100 lines (give or take), and the lines don’t necessarily have rhythm or rhyme to make memorizing easier. The poem that I did memorize of Longfellow’s was “The Ride of Paul Revere” in sixth grade, and it was a fun one. (no sarcasm) Fourteen stanzas of pure adrenaline that eventually led to my memorizing of Alfred Noyes’s “The Highwayman” in seventh grade. Both poem had a galloping rhythm that made it easy to retain the words, but while Longfellow’s was more adventurous and patriotic, Noyes was my “rip my heart out and stomp on it” poem that hurt worse than Poe. Every time I even read it nowadays, I tear up and start to choke before I get to Part Two. These poems are my roots, and if it weren’t for their tales of romance, adventure, war, and death, I probably wouldn’t have been so enamored by the literary marvel that is poetry. Because of poetry, I expanded my sights to short stories and novels. I can truly say that it all begins with one piece of literature. Feed that single drop of creative work into a child’s imagination, and that kid will run away with it. I’m a writer, a poet, and a reader because of my roots in poetry, not because of Black Beauty (first grade) or Oliver Twist (first – third grade). It’s because of the likes of master poets like Longfellow, Poe, and Whitman. I aspired to be one of the greats, but now, I’ll settle for true gratitude and a still burning flame in poetry. This entry was posted in Journal and tagged 30 Days, annabel lee, charge of the light brigade, day 12, grateful, highwayman, longfellow, memorize, noyes, oh captain my captain, poe, poems, poetry, ride of paul revere, song of hiawatha, tennyson, thankful, Thanksgiving, the raven, whitman. Bookmark the permalink.